What Can a Full-Service Investment Broker Do for You? In a nutshell, full-service brokers are suitable for investors who need some guidance. Full-service brokers are just what the name indicates. They try to provide as many services as possible for investors who open accounts with them. When you open an account at a brokerage firm, a representative is assigned to your account. This representative is usually called an account executive, a registered rep, or a financial consultant by the brokerage firm. This person usually has a securities license and is knowledgeable about stocks in particular and investing in general. Offer guidance and advice: The greatest distinction between full-service brokers and discount brokers is the personal attention you receive from your account rep. You get to be on a first-name basis, and you disclose much information about your finances and financial goals. The rep is there to make recommendations about stocks and funds that are suitable for you. Provide access to research: Full-service brokers can give you access to their investment research department, which can give you in-depth information and analysis on a particular company. Help you achieve your investment objectives: Beyond advice on specific investments, a good rep gets to know you and your investment goals and then offers advice and answers your questions about how specific investments and strategies can help you accomplish your wealth-building goals. Make investment decisions on your behalf: Many investors don’t want to be bothered when it comes to investment decisions. Full-service brokers can actually make decisions for your account with your authorization. This service may be fine, but be sure to require the broker to explain his or her choices to you. 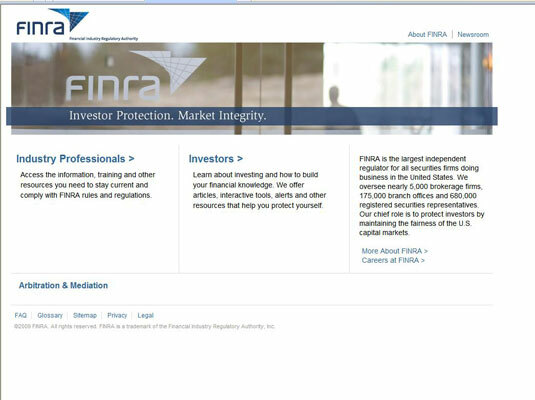 Before you deal with any broker, full-service or otherwise, get a free report on the broker from the Financial Industry Regulatory Authority (FINRA) by calling 800-289-9999 or visiting the FINRA Web site. The report can indicate whether any complaints or penalties have been filed against that brokerage firm or the individual rep.